He also says the partnership currently includes establishment of 180 Lines of Credit amounting to $11 billion in over 40 African countries. Kampala: Prime Minister Narendra Modi said today that India will strengthen its cooperation and mutual capabilities with Africa in combating terrorism and extremism. 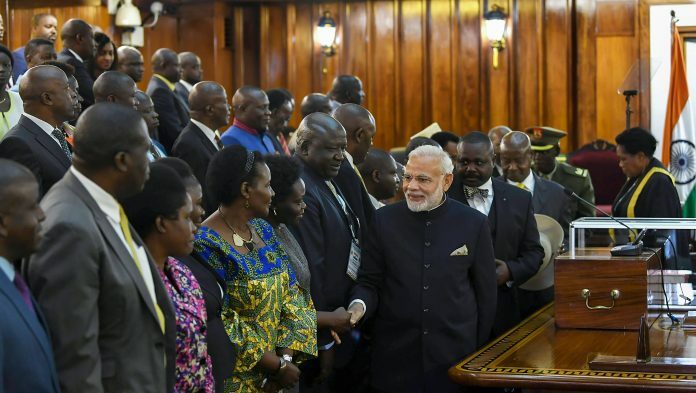 Addressing Parliament of Uganda, Modi said that India’s engagement with Africa will continue to be guided by 10 principles. He said that India is proud to be Africa’s partner and Uganda is central in this on the African continent. Africa would be at the top of India’s priorities, Modi said in his address, the first by an Indian prime minister to Parliament of Uganda. “We will continue to intensify and deepen our engagement with Africa. As we have shown, it will be sustained and regular,” he said. Modi announced that India would build a Gandhi Heritage Centre at the sacred site in Uganda’s Jinja, where a statue of Mahatma Gandhi now stands. “Our people are among many threads that connect Uganda and India together”.